Dr. Toney Optometry offers eye exams for the entire family, from regular check-ups and vision testing to disease diagnosis and monitoring. Conveniently located in downtown Batavia, clients come to us from St Charles, Geneva, West Chicago and other nearby suburbs, often referred by our satisfied clients. We carefully assess clients’ vision and help them understand any needs they may have, from contact recommendations to issues requiring surgery. If you have any questions or would like to set up an appointment, please call Dr. Toney Optometry today at (630) 879-1354 or contact us via our web form. We have been serving the Batavia community for over 35 years and look forward to the opportunity to serve you and your family. 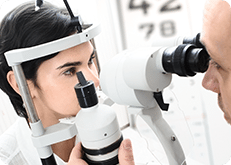 Dr. Toney Optometry of Batavia, IL provides eye exams and vision testing as well as treatment for glaucoma, red eye, allergies and more.